Last year I spent a lot of time researching California’s El Camino Real. I was trying to discover the original route, hoping to retrace it on a bike ride with my fourth-grade son, Kazu. What I eventually discovered was that ECR is a fiction, but more about that elsewhere. The point here is that in the process I read a lot of what I guess I would call popular histories. My interests strayed, as interests will do, and I wandered into such topics as stagecoach history in California (which expanded to the history stagecoach travel west of the Mississippi) settler abductions, Quantrill and his raiders, and other more-or-less related areas. As I picked up books and read them, I noticed a trend toward hyperbole. The more recent the book, the more exaggerated its title and contents. One example is “Empire of the Summer Moon: Quanah Parker and the Rise and Fall of the Comanches, the Most Powerful Indian Tribe in American History,” by S.C. Gwynne. The title should have tipped me off. But as I had just read about Quanah Parker in a settler-adduction book (his mother was kidnapped settler Cynthia Ann Parker, sometimes cited as the source story for the John Wayne movie The Searchers), and had a predisposition to thinking the Apaches were the toughest guys around (based on Elmore Leonard westerns), I thought I’d give it a shot. Anyway, to get to the point, I finally decided to cut out all the crap and go straight to the source. So last week, I checked out Volume I of H.H. 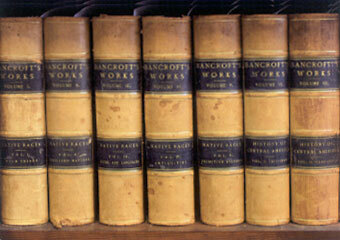 Bancroft’s seven volume History of California, published between 1884-90. And so far, I have to say that it is for the most part refreshingly low-key, if not always crystal clear. Where did it come from – this nation-state, this world commonwealth, this California? How did an American state, one in fifty, rise to such global stature, with its $1.5 trillion economy making it, in 2005, the fifth-ranked economy on the planet? Never before in human history, it could be argued . . .
Etcetera, etcetera, blah, blah, blah. The past of California, as a whole and in each successive phase, furnishes a record not excelled either in variety or interest by that of any New World province. Anyway, my plan is to read these side-by side. At least through the Bear Flag Revolt and the Treaty of Guadalupe Hildago. I sort of lose interest once gold is discovered and people flood in and and the rest becomes, you know, history.